It should go without saying, but the idea and ethos behind group housing is to get sows out of stalls. The industry's move toward greater transparency in our animal husbandry practices has coincided with increasing public concern over meat sources. This pressure, combined with an industry adopted Code of Practice (since 2014) in Canada, and various legislative initiatives in some states is leading more and more producers to move to group housing over stalls. However, within the movement to loose sow housing, there are two distinct groups whose differences often go unmentioned: those who practice post-insemination reentry, and those who practice post-implantation reentry. To understand the reasons producers choose post-implantation reentry, it is helpful to look back at history. Let's go back fifty years. It was seen as inevitable that sows were aggressive animals, especially during pregnancy. Stalls were originally put forth as a solution to keep pigs separated so that they were less aggressive, and their feed could be managed individually if necessary. Insemination, vaccinations and pregnancy checks were easier because sows were always in the same place—their stall. Fast forward to the late 1990s. Consumers, weary of the confining nature of stalls, began to demand that their meat come from more humane sources. 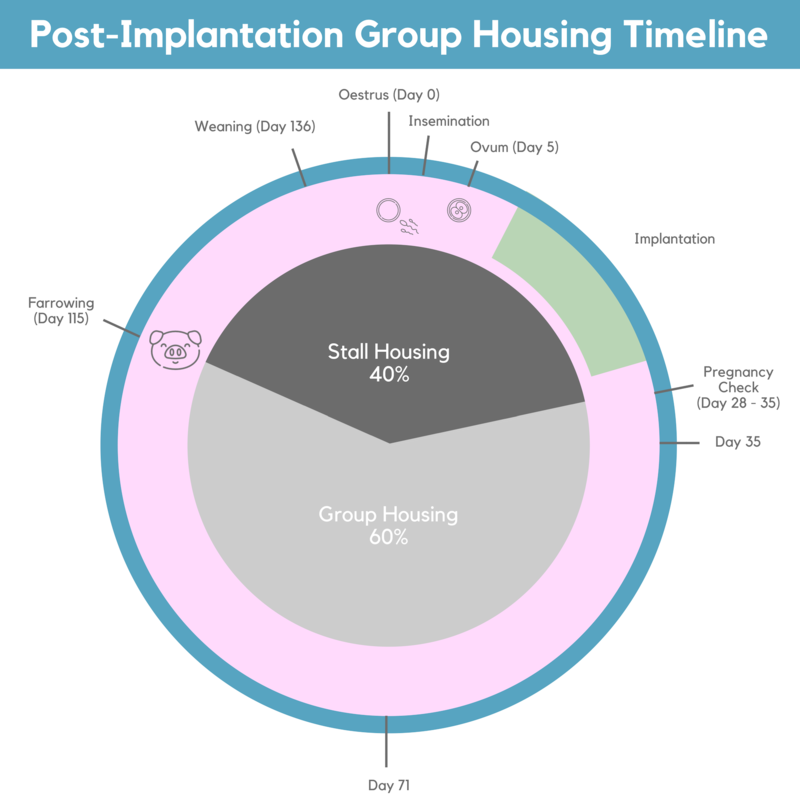 European countries gradually answered this call for less confined housing by mandating a complete switch back to group housing by 2013; only this time there were some technological solutions in place to address earlier concerns such as individual feed management and the ability to separate out pigs in need of vaccines or pregnancy checks without having to resort to stalls. As producers began to implement these systems and move sows into larger groups, they noticed that the aggression issues they had been told were inevitable were lessening. Researchers began to note that the prior understanding of sows as aggressive was an unfair assessment made when looking at animals who were housed either in small groups, causing the hierarchy to be much stricter, or looking at animals housed in groups where there was always competition for resources such as feed and water. In 2003, a study done by PH Brooks noted that group housing barns designed with a circuitous pen design, that sows could easily follow to give them natural access to feeding and resting areas, reduced aggression and competition for resources. The heart of the issue was becoming clear; the problem wasn't sow aggression, it was barn and ESF system design. And once again, that is where we are today. In modern group sow housing some producers choose to wait to mix sows until after implantation because they are concerned that their pens might cause the sow too much stress while her body is in the process of implantation. Barn designers within these systems maintain that their barn designs aren't intended for post-insemination mixing. We are here to ask why. Some advocates for later mixing claim better implantation and higher success rates in pregnancy. Others claim that they have reduced stillbirths. When you have a good management system and you don’t see a lot of aggression in the sows we saw no impact on our production numbers. And in fact, in the ones that were mixed earlier... the ones that were mixed straight out of the farrowing room and those that were mixed post insemination, we’ve seen a reduction in stillborns. We are hoping to do some more work to try and understand why that would occur. [Is it] because they are getting exercise so very early on? Do they get better placental development or distribution on the uterine horns? We don’t really know; but we’re not the only site that has seen this reduction in stillborns in loose housed sows. So if the research shows that in well-managed non-aggressive systems early mixing can benefit production, why are so many group housing advocates in favor of post-implantation mixing? The only logical conclusion we can come to is that there is a fear of aggression within these systems, so equipment manufacturers and barn designers are advocating for later mixing times to hide the flaws in their system's design. Because the research is clear; early mixing times in non-violent systems lead to higher conception rates and decreased stillborns (Brown, 2015). There are several flaws that we see in other barn system designs, but the foremost issue is that every rear-exit ESF system on the market increases a pig's natural sense of competition for resources, thereby increasing aggression. PH Brooks' 2003 research study found that feed stations "must be 'walk through'" in style to reduce this aggression. Providing the sow with total protection whilst she is feeding ensures that she receives her complete ration and removes competition for feed, which is a major contributor to physical damage. Well designed and operated group housing systems...provide the best environment for large groups of housed sows and can make a significant contribution both to improved sow welfare and sow feed management. Rear exit systems break Brook's cardinal rule of good barn flow and don't provide clear places for sows to eat, dung, and rest; and they don't allow sows to eat in peace without threat of violence (Brooks, 2003). 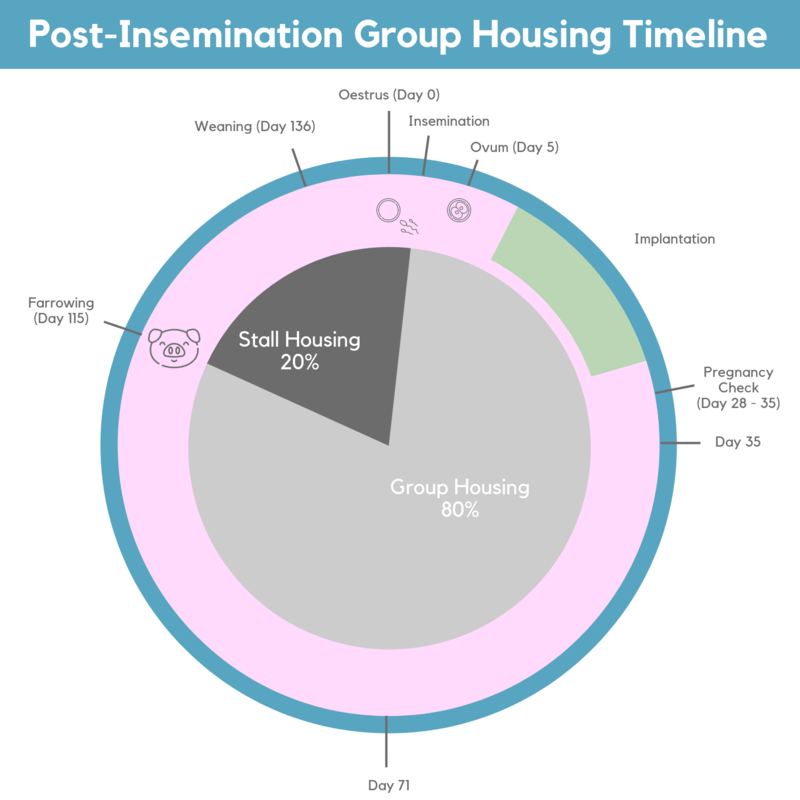 Why Does It Matter if You Do Post-Implantation or Post-Insemination Mixing? Bottom line: if sows can't go into the pen after breeding, you don't have loose housing. You may have something closer to loose housing than stalls, but it's not true loose housing. Why does that matter? Because good animal husbandry matters. Doing what is right for the sows matters.